Many people might consider a program to be just one really large project. A project is a singular effort of defined duration, whereas a program is comprised of a collection of projects. Problem solved, right? Actually, it’s a bit more complex than that. While programs and projects actually have several different characteristics and different functions within an organization, they also have many commonalities. Likewise project managers and program manager are two different roles within an organization, as well, yet they share similar duties. While the state of the industry is always changing, it behooves you and your organization to know when your projects should become programs. Let’s look at how they’re different – and how they’re the same – so you can apply the concepts to your own programs and projects. Structure: A project is well-defined, with a Project Charter that spells out exactly what the scope and objectives are for the project. A program tends to have greater levels of uncertainty. (You can download a free project charter template here.) The team is also bigger. The program team are supervising and coordinating the work on a number of projects so while the core team may not have that many people in, the wider team includes the project managers and all the project team members. Effort: This is the most significant difference between projects and programs. A project represents a single effort. It is a group of people forming a team working towards a common goal. A program is different; it is a collection of projects. Together all the projects form a cohesive package of work. The different projects are complimentary and help the program achieve its overall objectives. There are likely to be overlaps and dependencies between the projects, so a program manager will assess these and work with the project managers concerned to check that overall the whole program progresses smoothly. Duration: Some projects do go on for several years but most of the projects you’ll work on will be shorter than that. On the other hand, programs are definitely longer. As they set out to deliver more stuff, they take longer. Programs tend to be split into tranches or phases. Some projects are also split like this, but not all projects last long enough to be delivered in multiple phases. Benefits: A project team works towards achieving certain outputs, that is, what you get at the end. For example, this could be a set of deliverables that form a software package, or a new retail branch, or whatever it is that you are working on. The benefits of a project tend to be tangible: you get a ‘thing’ at the end of it. A program team works towards delivering outcomes. Outcomes can be tangible but are often not. The benefits of a program are the sum of the benefits of all the different projects and this could amount to a policy or cultural change, or a shift in the way an organization works. All that might make programs seem really different to projects. However, while projects and programs do have differences, there are some characteristics that are similar to both. Here are four traits that projects and programs have in common. They are temporary: Projects and programs are not long term endeavors. They exist for a while until the work is done, and then the project or program structure and the team are disbanded. This is part of what makes project and program work so interesting – you can always see the end and you have the opportunity to work on lots of different initiatives over your career! They have business cases: This is similar to all the work that a company does, even the business as usual stuff. Projects and programs should only start when they have a valid business case. In other words, as project and program managers, we only work on activities that will add some real value and that have already been shown to make good business sense. There is no point in wasting time working on something that isn’t going to benefit the company. They are aligned to strategic objectives: It should be easy to see how the projects and programs you work on line up to the company’s strategic objectives. If this isn’t specified in the business case, ask your project sponsor. It should be easy to see that the work your team is doing on the project or program directly contributes to the company’s goals. Otherwise, what’s the point? They deliver change: This is the big one – projects and programs both deliver change. You do a project or a program and at the end something is different. This could be something big, or something small. Programs tend to have larger goals for changing the status quo and often include an element of cultural change but the concept is the same. 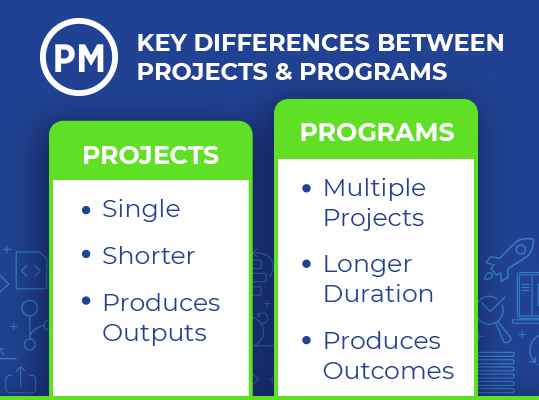 Do you now think that you can define projects and programs as two different things? One definition of a program is a temporary organization created to coordinate, direct the work, and supervise the delivery of a number of related projects that all contribute to a particular outcome. A project, on the other hand, is a temporary organization designed to deliver a particular output. Many people believe that the career path for a project manager ends up in program management. You start off perhaps as a project coordinator, become a project manager and then ‘graduate’ to managing programs. It doesn’t have to be like that – you can manage bigger and bigger projects and there is nothing wrong with staying in project management for your whole career. If you do want to branch out and work on programs, many of the skills you use as a project manager will be very valuable to you as a program manager. You should also be able to show that you are capable of seeing the bigger picture and working across multiple strands of work. At a program level people should be able to operate with an overview of what is happening on each of the projects and help the project teams work together. Whether you stay with projects or move into programs, you are sure to have a very interesting job! Whether you’re managing projects or programs, the right tools are required to support your team and help you manage the effort. You need a way to see across all your projects. ProjectManager.com can enable you to see your resource allocation across all your projects with real-time dashboards and reporting functions and help you keep your projects on track.